There are a few periods that I could conceivably called favourites. I love the splendour of Napoleonics, the match of forces of the American Civil War (a better red army/blue army match it would be hard to find), the Great Northern War and Ancients. Ancients has a particular attraction to me as evidenced by the number of painted ancient armies I have. Less attractive to me but attractive none-the-less are World War 2, moderns, the European Wars of the late 1800s and the Thirty Years War/English Civil War. Overall, however, my favourites are naval and my favourite naval period is the transition from wood to steel and on to World War 1 – when warships were powered by coal and when the big gun was king. The pre-dreadnought period to the end of World War 1. Love ‘em! Given my wide love of periods, scale is also varied a little as well. 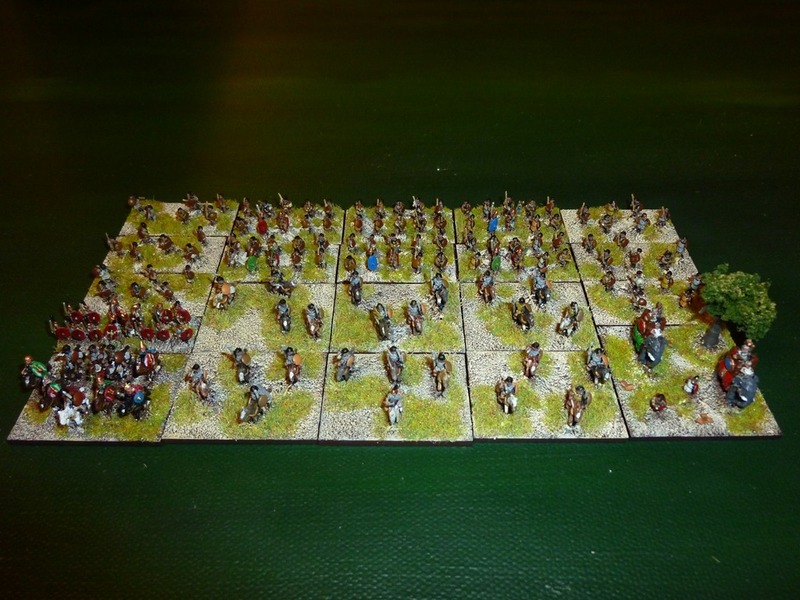 From a figure point of view, my favourite scales would have to be 15mm for detail with a sense of numbers of troops. A great compromise between the detail and appearance on figures and space. It is nice to shuffle a couple of hundred figures around a table whilst not requiring a forklift to carry them to the car after a game. 6mm is my other favourite scale for wargaming. Taking a larger base (say, the 15mm size base) and then flooding that base with figures also gives a satisfying appearance of a large number of troops and is fun to shuffle figures around the table on. As naval, however, is in my favourite wargaming period, then for figure scale I would need to say 1/600, 1/1200 and 1/3000 as the sizes of most of the ships I have in my collection. I do like 1/6000 vessels and appreciate the speed that one can paint up a fleet in that scale but 1/3000th is still my preferred scale for World War 1 and pre-Dreadnought. I have some 1/1200th scale vessels on order for my transition project – the Battle of Lissa. This is a can of worms so large that even "Gelignite" Jack Murray would have trouble opening it. However, girding one’s loins and stepping forward – DBA and HotT would be two of my favourite sets. However, I am not one to keep doing the same thing day after day, week after week, year after year, so I like to look at different sets and move forward. I started playing DBA again only about a year ago after a 10 year layoff – and came second in the DBA competition at Cancon 2011. I am looking forward to version 3 of DBA. I have not played HotT in a while – maybe about 8 years but played it frequently before that. Perhaps I’ve tired. Naval rules of favour would be General Quarters 3 and something for the transition games – mid to late 19th century naval. I’m still looking at that. For WW2, modern and Future War I like the Blitzkrieg Commander II, Cold War Commander and Future War Commander. Good game, done quickly and a familiar Warhammer style of rules. Command and Colors Ancient – by a long shot. I also like The Great War in Europe and Chariots of Fire. Hmm, seems I am a GMT Games fan. From the metal perspective, the scale matters as to favourites. I have had some Minifigs 15mm ACW figures painted recently and they weren’t too bad, However, the favourite, generally, for 15mm figures would have to be Essex Miniatures. If I was looking for 15mm Napleonic then AB Miniatures would be the figures of choice. I like the Baccus 6mm ranges of figures as well as some of the other 6mm manufacturers, such as the ranges from Rapier Miniatures and Heroics & Ros. They are the robust ranges in that scale. Adler Miniatures make some lovely figures in a nominal 6mm scale as well although they are a little more fragile. I haven’t any hard plastic figures so will not comment on them at the moment. However, when we turn to nautical models, then in hard plastic I love the Games Workshop DreadFleet models. For metal, I like Navwar’s 1/3000 scale if only for completeness although some models are a little rough. I am tempted with GHQ’s 1/2400 scale range of vessels and will likely look at some of them this year. For tanks and such – GHQ and CinC are the two manufacturers of choice at 1/285 scale. Whilst Heroics & Ros may have a larger range, the models from these manufacturers are just way superior. Interestingly, I will happily use Heroics & Ros or Adler miniatures as the figures to go with these companies vehicles as neither GHQ nor CinC do good infantry. I have not had any soft plastic for years. I guess these have improved in the last 20 years and maybe I should try some as the range of figures now is huge. My most regular opponent in Singapore is Anthony and a trip to his man cave, figures under arm, is always a enjoyable occasion, especially when Nor is in a cooking mood. In Australia, my most regular opponent there would have to be Doug who still manages to beat me even though he is sliding into his cups – although I still claim it was 4-5! Zulu – and if not an inspiration, certainly the film for adding goose pimples to the arm. There are a couple of series. I think Simon Scarrow’s Legionary series with Macro and Cato are wonderfully inspiring. Also inspiring is Harry Sidebottom’s series set during the later Empire when Rome was struggling against the Sassanians ((interestingly the spell checker in Windows Live Writer is suggesting “Tasmanians” to me as the correct word I was trying to spell)). I like Mal Wright’s Naval Art and I especially like the Black and White photograph collection in the US Naval History and Heritage Command although it should be noted that there is some reorganisation going on here. See art above. The Internet is such a huge resource now of images, maps, histories, old books and such that I don’t think there is one place to start except Google. Search the terms then see the results. Note that there is an art to searching as well so do it frequently and vary the search terms a little to see how different the results are when they come back – the more you practice with it the better you will get.